Antique painted miniature enameled pin diamond: Description by Adin Antique Jewelry. 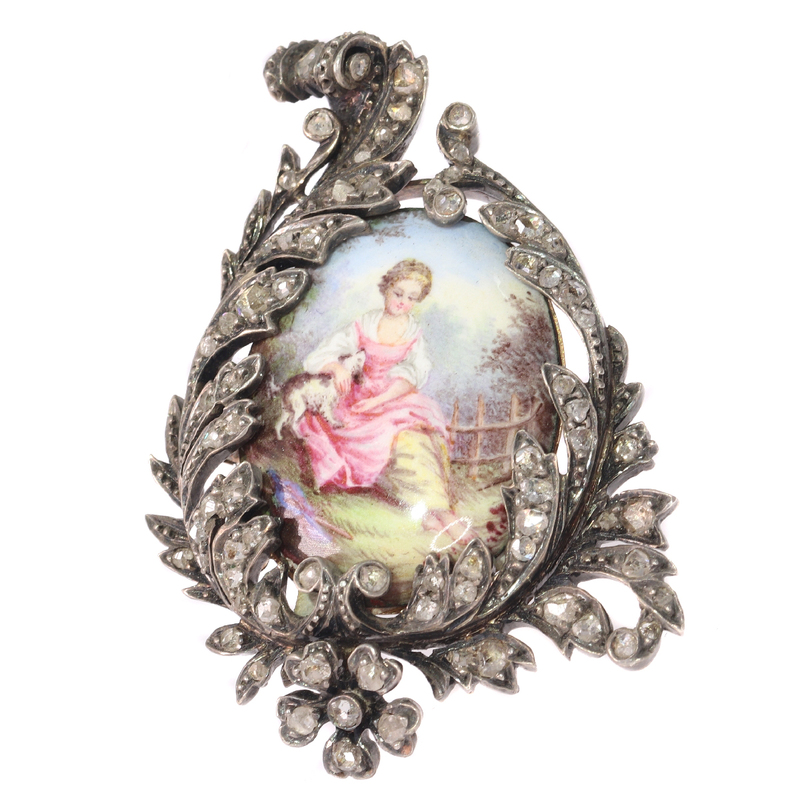 The graceful asymmetrical garland with 73 rose cut diamonds encrusted in the silver top of this 18K red gold Victorian brooch from 1850 frames a delicate hand-painted enameled miniature depicting a woman sitting barefoot in the grass petting a dog on her lap. This jewel is a gift of reminiscence to innocent joy. Style specifics: The Romantic Victorian Period - Experts divide the reign of Queen Victoria, also called The Victorian era (1837-1901) in to three peiods of about twenty years each; The Romantic Victorian Period (1837 - 1860), The Grand Victorian Period (1860 - 1880), and the Late or Aesthetic Victorian Period (1880 – 1901). Diamonds: 73 rose cut diamonds. We do not have the weight of the diamonds which is normal in our trade when it comes to rose cuts.